Mashham is a very attractive market town, which is well known for sheep farming, situated on the bank of the River Ure in Wensleydale, North Yorkshire. Masham has a large market square, which is also a car park, and is surrounded by beautiful Georgian houses and was the site for the annual Sheep Fairs with animals coming in from Fountains and Jervaulx Abbeys. The tradition continues on a smaller scale each September. Market days are held on Wednesdays and Saturdays which are popular with both visitors and locals. Fearby is 2 miles west of Masham and is a very pretty village with a large green and the Black Swan pub, which is a caravan and camping holiday park. Healy another pretty village is another mile further on and is dominated by St. Paul’s church. The Pals marched through these two villages after they disembarked from Masham Railway Station. They did not know it at the time but this was there long walk to the Somme. Colsterdale is the beautiful valley of the River Burn which is a tributary of the River Ure. All though Colsterdale is not in Nidderdale it lies within the Nidderdale Area of Outstanding Natural Beauty. During the First World War Colsterdale was the site of the training camp for the Leeds Pals and a memorial now takes pride of place there. The camp later became a Prisoner of War camp for German Officers. We park in the lay-by next to the bridge near the road end leading to the Leeds Pals memorial. We turn right at the Leeds Pals Memorial 1/2 mile sign and walk uphill, passing the Wesleyan Chapel, to the war memorial where we take a close look. We then carry on walking forward on the road until we come to a t-junction here we turn right and follow the tarmac road to Spout House (farm). We walk to the left of the farm and follow the track and we go over a canal and then a small beck and keep following the track right round the bend until we come to a gate. We go through the gate and then left through another gate opposite a building onto the coal road. We now follow the coal road up hill and along the edge of the valley then the track goes downhill. At the bottom of the hill we come to a bridge over the River Burn with High House Farm on the other side. We go over the bridge and then turn right picking up the no through tarmac road and follow this road back along the valley of Colsterdale until we come to a red telephone box and a car parking area. Here we turn right and go over the little white wooden bridge, turn left and go through a gate. We walk uphill and then cross a spring and then walk to the left of the buildings down the slope and through the gate into the wood. We follow the path through the wood into an open field, cross over the canal, and head towards the stone barn. 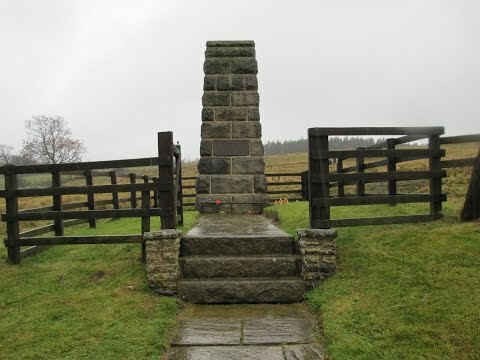 We go through the gate in the wall at the side of the barn and onto the road and turn left back along the road to the Leeds Pals memorial. We then make our way back to our car. Approx 8 miles using OS map 302 and OL30. Colsterdale is near Masham in North Yorkshire. From the A1 take the B6267 through Nosterfield towards Mashham. At the A6108 turn right go over the bridge and follow the main road bypassing Masham town centre and take the first left to Fearby and Healy. After leaving Healy follow the road turning left at the y-junction, go downhill to the bridge where there is a lay-by for parking. The monument is up the little road on the right, signposted Leeds Pals. There are no public toilets the nearest ones are in Masham. For refreshments there is the Black Swan in Fearby and in Masham there are three pubs, the Bruce Arms, The Bay Horse Inn and The White Bear, and many shops.